Despite a steady downpour of rain, a group of domestic workers and their supporters gathered at the 24th Street Bart Plaza this morning, carrying posters that called for dignity and economic justice throughout the industry. With music, dance and testimonials, the group of men and women announced the launch of a statewide campaign to make overtime pay for domestic workers a permanent protection in California. In 2014, the state became the third in the nation to implement a bill of rights providing domestic workers like housekeepers and cleaners the rights to overtime pay, meal breaks, and workers compensation— an important victory for a workforce that has historically been excluded from these protections under the federal Fair Labor Standards Act. But this victory may be short lived, as this bill of rights came with a sunset provision that sets its expiration in 2017. Workers and their advocates present at the rally expressed their support for new legislation that, if enacted, would take out this provision and make the overtime pay requirement permanent. 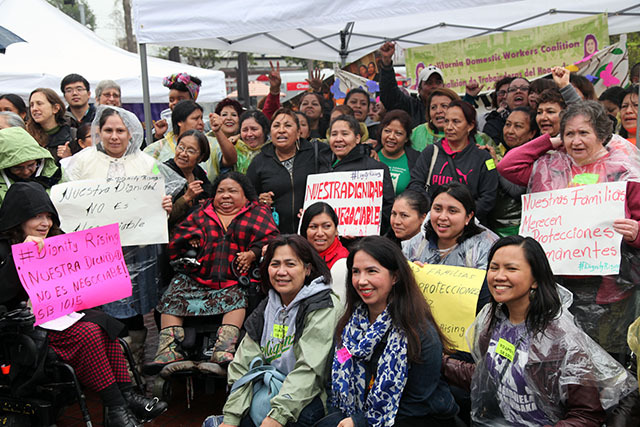 “We began organizing behind this bill in 2006, and this will be our fourth attempt to get it passed [permanently],” said Andrea Lee, Co-Director of Mujeres Unidas Y Activas, a local group organizing under the California Domestic Workers Coalition. The coalition is spearheading the campaign in support of SB1015, the legislation introduced by Senator Connie Leyva that would remove the current bill of rights’ sunset provision. “We are gathering community support and hope to pass the legislation in Assembly,” said Claudia Reyes, a spokesperson for Mujeres Unidas Y Activas. The group plans to take the campaign to Sacramento on March 28. More than 52,000 people are employed as domestic workers in the Bay Area, according to data provided by the coalition — and a majority of these workers are women. During testimonials shared at the rally, some said that they are not entitled to the same basic rights given to other workers in California, such as lunch breaks and designated time off. Others said that working in the industry has subjected them to exploitation and abuse, both verbal and physical. Nomo explained that in her work as a caregiver, she often works overtime and is not permitted to leave her shift unless she is relieved by another caregiver. Under the 2014 bill of rights, Nomo and other domestic workers in California are eligible to time-and-a-half pay for work hours that extend a workday beyond eight hours, as well as a day off following a seven-day work week. “This law raised the standards in the industry — it made it possible for me to put food on the table for my family, to buy medicine, and to keep meager savings,” said Nomo. But without permanent protection, these new standards will be challenged next year. Josselyn Cobrera Chang, a San Francisco City College student, came to support the workers in their struggle and wanted to know what she could do to help. If the law passes in the state assembly, Governor Jerry Brown is expected to sign it in September.